Plant cells detect the presence of potentially pathogenic microorganisms in the apoplast via plasma membrane-localized receptors. Activated receptors trigger phosphorylation-mediated signaling cascades that protect the cell from infection. It is thought that signaling triggered by the detection of exogenous signals, such as bacterial flagellin, can be amplified by endogenous signals, such as hormones or debris caused by cell damage, to potentiate robust immune responses. For example, perception of flagellin and other microbial molecules results in increased expression of endogenous PROPEP transcripts that give rise to AtPep peptides which also activate immune signaling. Phytohormones such as methyl-jasmonate also induce PROPEP expression, suggestive of additional hormone-mediated feedback loops that similarly amplify immune signaling. The current study aimed to determine if perception of jasmonate is genetically required for AtPep1-induced immune responses in Arabidopsis thaliana. We assessed several AtPep1-induced immune responses in plants expressing a non-functional variant of the jasmonate receptor CORONATINE-INSENSITIVE 1 (COI1). We found that coi1-16 mutants are severely compromised in some AtPep1-induced immune responses, while other AtPep1-induced responses are maintained but reduced. Our findings build on previously published work and suggest that JA perception plays a role in immune responses triggered by AtPep1. Plants lack a humoral immune system and rely solely on the innate ability of each cell to detect potentially harmful pathogens and defend against disease. Plasma membrane-localized pattern recognition receptors (PRRs) bind ‘non-self’ molecules characteristic of entire classes of microbes known as pathogen-associated molecular patterns (PAMPs), which are typically integral to microbial lifestyles and are thus under strong selection pressure . Examples include bacterial proteins flagellin and Elongation Factor Tu (EF-Tu), which are recognized in Arabidopsis thaliana by receptor kinases FLAGELLIN SENSING 2 (FLS2) and EF-Tu RECEPTOR (EFR), respectively [2–4]. PRRs also bind ‘infectious-self’ molecules known as damage-associated molecular patterns (DAMPs), such as cell wall fragments or small peptides that are thought to be released by the plant cell during pathogen invasion and/or wounding [1, 5]. For example, the Arabidopsis PRRs AtPEP RECEPTOR KINASE 1 (PEPR1) and PEPR2 bind endogenous AtPep peptides resulting in the activation of immune responses [6–9]. Many PRRs function in protein complexes, requiring regulatory co-receptors for full activation and subsequent signal transduction [1, 10]. Upon ligand binding, FLS2, EFR, and PEPR1/2 each form a complex with the receptor-like kinase BRI1-ASSOCIATED RECEPTOR KINASE 1 (BAK1) [11–16]. PRR activation and complex formation lead to pattern-triggered immunity (PTI), characterized by an influx of Ca2+, the activation of receptor-like cytoplasmic kinases (RLCKs), a rapid and transient apoplastic oxidative burst, the activation of mitogen-activated and calcium-dependent protein kinases (MAPK and CDPKs), and transcriptional reprogramming resulting in a basal immune response that is effective against most potential pathogens [1, 17]. Interplay between plant immune and hormone signaling has been observed in several systems . In particular, the antagonistic roles of salicylate (SA) and jasmonate (JA) in defense against biotrophic and necrotrophic pathogens has been well documented , and the involvement of these and other phytohormones in pattern-triggered signaling has also been observed . As one example, perception of several AtPeps causes an increase in the classical SA- and JA-triggered marker genes PATHOGENESIS RELATED-1 (PR-1) and PLANT DEFENSIN 1.2 (PDF1.2), and expression of AtPep precursor PROPEP genes is induced by treatment with methyl-salicylate (MeSA), methyl-jasmonate (MeJA), immunogenic peptides, as well as pathogen infection and herbivore feeding [7, 8, 21]. These and other observations [22, 23] suggest a feedback loop that amplifies immune signaling following pathogen infection. Here we present data demonstrating that the JA receptor CORONATINE-INSENSITIVE 1 (COI1) is genetically required for AtPep1-induced immune outputs to varying levels. Our work builds on earlier observations  and supports a role for JA signaling in AtPep1-induced responses. Arabidopsis thaliana ecotype Columbia (Col-0) and previously described mutants bak1-5 , glabra1 (Col gl1) , SA-induction deficient 2-2 (sid2-2) , and coi1-16 (in the Col gl1 background)  were used in this study. These lines have been propagated in lab environments and were not collected from the wild; see Acknowledgements section for the source of each seed line. For sterile assays, seeds were surface-sterilized and sown on half-strength Murashige & Skoog (MS) agar plates (0.8%) and stratified in the dark at 4 °C for 3 days before being exposed to a 12 h photoperiod. For soil assays, seeds were similarly stratified and seedlings were grown on soil in controlled environment chambers at 22 °C with 30% humidity in a 10 h photoperiod. 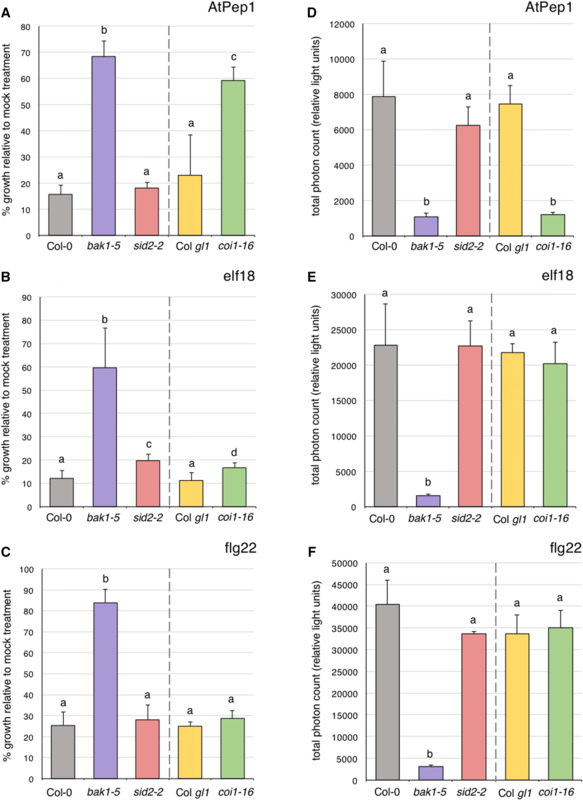 Immunogenic elicitor peptides flg22, elf18, and AtPep1 were synthesized by EZ Biolabs (USA) and used in seedling growth inhibition, oxidative burst, and MAPK activation assays as described previously . For gene expression assays, RNA was extracted from twelve 2-week-old seedlings grown in sterile liquid culture using the Aurum Total RNA Mini Kit (BioRad) and mRNA was reverse transcribed using an oligo dT18 primer and SuperScript III (Invitrogen) following the manufacturer’s directions. Quantitative real-time PCR was performed using SsoAdvanced Universal SYBR Green Supermix (BioRad) and measured on a CFX96 Touch Real-Time PCR Detection System (BioRad). Melting curve analysis confirmed that all primer pairs amplify a single product; primer sequences are listed in Additional file 1. Arabidopsis seedlings constantly exposed to immunogenic peptides display severe growth inhibition, presumably due to continual activation of immune signaling that diverts resources away from normal growth and development. Although cross-talk between immune and hormone pathways has been well-demonstrated [18, 19], how plant hormone signaling influences immune-induced growth inhibition is largely unknown. While performing experiments for other projects in our lab, we found that the JA receptor mutant coi1-16  was almost as insensitive as the immunodeficient mutant bak1-5  to AtPep1-induced seedling inhibition (Fig. 1A). We found this to be specific to AtPep1, as sensitivity to the EF-Tu epitope elf18 and the flagellin epitope flg22 was comparable to controls (Fig. 1B, C). Comparatively, the mutant sid2-2, which cannot synthesize SA due to lack of functional isochorismate synthase , was not affected in these assays (Fig. 1A–C). To account for any inherent growth differences between genotypes, total fresh weight of seedlings grown in the presence of immunogenic peptides was calculated relative to their growth in MS media. All genotypes used in this study grew similarly in MS media as shown in Additional file 2. As seedling inhibition is considered a late immune response, we extended our analysis to test if JA perception via COI1 is also required for an earlier immune response such as the RESPIRATORY BURST OXIDASE HOMOLOG D (RBOHD)-mediated burst of reactive oxygen species (ROS). We found that while elf18- and flg22-induced ROS was unaffected in coi1-16 compared to controls, AtPep1-induced ROS was as severely inhibited as in bak1-5 mutants (Fig. 1D–F), indicating that JA perception is required quite early in AtPep1-triggered signaling. It was previously shown that coi1-1 mutants are compromised in AtPep1-induced seedling growth inhibition, ROS, and ethylene production, while flg22-triggered responses were not affected . Thus, our study using the independent coi1-16 allele, which is in the Col gl1 background , corroborates previous work. The same phenomenon was observed in the allene oxide synthase (aos) mutant which cannot synthesize JA , suggesting that both JA biosynthesis and perception are genetically required for AtPep1-mediated immune signaling. While some PTI responses are directly linked via phosphorylation cascades, genetic evidence supports parallel activation of other outputs downstream of PRR activation . For example, elicitor-induced MAPK activation and RBOHD-dependent ROS are rapid and transient responses that occur simultaneously, both peaking at around 10 min following PRR activation . While activation of RBOHD has been directly linked to phosphorylation by CDPKs and RLCKs [31–34], evidence from several studies [35–37] has suggested that the NADPH oxidase RBOHD and MAPKs are independently activated. For example, flg22-induced activation of MPK6, MPK3, and MPK4/11 is unaffected in rbohD mutants, and flg22-induced oxidative burst is maintained in mpk3 mpk6 mutants . We were thus interested to assess if other AtPep1-triggered responses, such as MAPK activation, were also genetically dependent on JA perception. To test this, we treated Col gl1 and coi1-16 plants with flg22, elf18, or AtPep1 for 10 min and compared the activation of MPK6, MPK3, and MPK4/11 using immunoblot analysis. While flg22-induced MAPK activation was comparable between coi1-16 and control Col gl1 plants, we observed slightly reduced MAPK activation in coi1-16 mutants following treatment with elf18 and AtPep1 (Fig. 2). 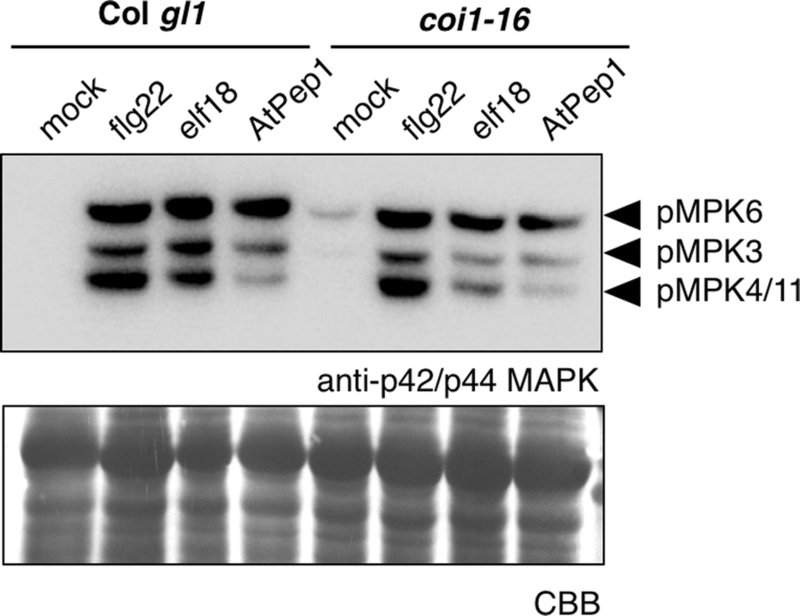 Although reduced, MAPKs were still activated by all three immunogenic elicitors in coi1-16, suggesting that JA perception is only partially required for AtPep1-induced MAPK activation. Activated MAPKs are known to regulate transcriptional changes via phosphorylation of WRKY and other transcription factors , as are CDPKs [39, 40]. Transcript profiling experiments have delineated sets of genes that are dependent on MAPKs, CDPKs, or both, to varying levels . Because we observed a slight reduction in MAPK activation in coi1-16 mutants we were interested to test if MAPK-regulated gene expression was also affected. We found that although the MAPK-specific gene FRK1  and the MAPK-dominant genes CYP81F2 and WAK2  were clearly induced in coi1-16 mutants after AtPep1 treatment, they were expressed to significantly lower levels than in control Col gl1 plants (Fig. 3A–C). A similar trend was observed when we compared AtPep1-induced expression of the MAPK-CDPK synergistic genes NHL10, CYP82C2 and PER4  and the CDPK-specific gene PHI-1  (Fig. 3D–G). Induction of At1g51890  was also reduced in coi1-16 mutants, however, interestingly, AtPep1-induced expression of FMO1  was similar in coi1-16 and Col gl1 (Fig. 3H–I). AtPep1 is a 23-amino acid peptide processed from a precursor peptide encoded by PROPEP1 . PROPEP1 is part of a six-member gene family in Arabidopsis , several members of which are induced by immune-related phytohormones such as MeSA and MeJA . 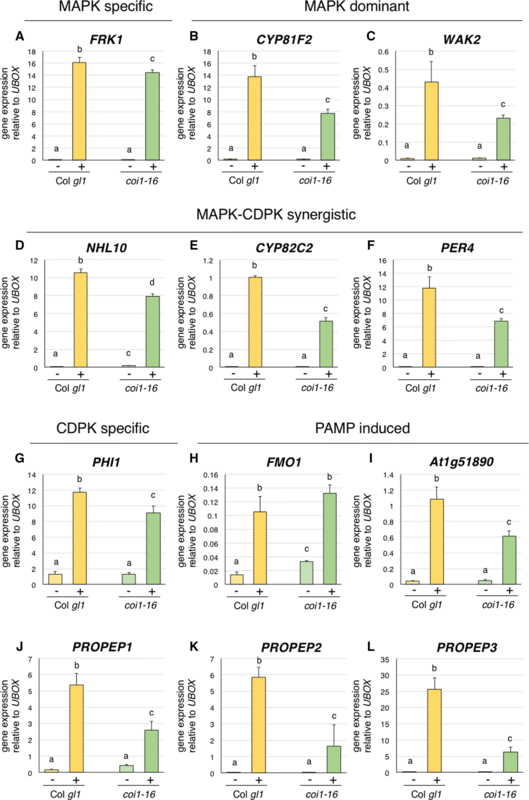 Treatment of Arabidopsis plants with AtPeps differentially induces expression of several precursor PROPEPs  and PEPR1/2 , indicative of positive feedback that is often observed in signaling pathways. We found that AtPep1-induced expression of PROPEP1, PROPEP2, PROPEP3, and PEPR1 was strongly reduced in coi1-16 compared to Col gl1 (Fig. 3J–L; Additional file 3), further supporting a role for JA perception in AtPep1-mediated signaling. Here we show that AtPep1-induced seedling growth inhibition and oxidative burst are strongly compromised in coi1-16 mutants, which is in full agreement with results obtained in a previous study using the coi1-1 allele . We additionally show that AtPep1-induced MAPK activation and gene expression are maintained but reduced in coi1-16 mutants. Together, our data suggest that JA perception via the COI1 receptor is involved in AtPep1-triggered responses. Future work is needed to decipher the mechanistic interplay between JA and AtPep signaling in the plant immune response. Immunological assays were conducted with saturating concentrations of eliciting peptides flg22, elf18, or AtPep1. Global transcript profiling was not conducted; only a panel of representative elicitor-induced genes was analyzed. DRH and JM designed the study and wrote the paper; DRH, LEG, and JM performed the research. All authors read and approved the final manuscript. We thank Melissa Bredow and Ruxandra Bogdan for critically reading this manuscript and all members of the Monaghan Lab for engaging discussions. We are grateful to George Haughn (University of British Columbia) for sharing Col gl1 seeds, Robin Cameron (McMaster University) for sharing sid2-2 seeds, Cyril Zipfel (Sainsbury Laboratory) for sharing bak1-5 seeds, and Tina Romeis (Free University Berlin) for sharing coi1-16 seeds. Plants were maintained in the Queen’s University Phytotron by Jeffrey Rowbottom and Dale Kristensen. Research in our lab is funded through the Natural Sciences and Engineering Research Council of Canada, the Canadian Foundation for Innovation, the Ontario Ministry of Research, Innovation and Science, and Queen’s University. LEG is currently supported by an Ontario Graduate Scholarship. 13104_2018_3628_MOESM1_ESM.pdf Additional file 1: Primers used in this study. A list of primers used for qPCR. 13104_2018_3628_MOESM2_ESM.pdf Additional file 2: Fresh weight of seedlings grown in MS media. Fresh weight of seedlings 10 days after continual growth in sterile MS liquid media. Values are means + standard deviation (n=6 plants). Three biological replicates were performed with similar results. Statistically significant groups (p < 0.05) are indicated with lower-case letters based on a one-way ANOVA followed by Tukey’s post-test. 13104_2018_3628_MOESM3_ESM.pdf Additional file 3: AtPep1-induced PEPR1 expression in coi1-16 mutants. Twelve 14-day-old Col gl1 and coi1-16 seedlings were treated with water (-) or 1 µM AtPep1 (+) for 120 minutes prior to RNA extraction. Quantitative real-time PCR was used to assess expression level of PEPR1. Values are means + standard deviations (n=3 technical replicates from the same cDNA), normalized against the relative average expression of UBOX from the same sample. Three independent biological replicates were performed with similar results. Statistically significant groups (p < 0.05) are indicated with lower-case letters based on a one-way ANOVA followed by Tukey’s post-test.